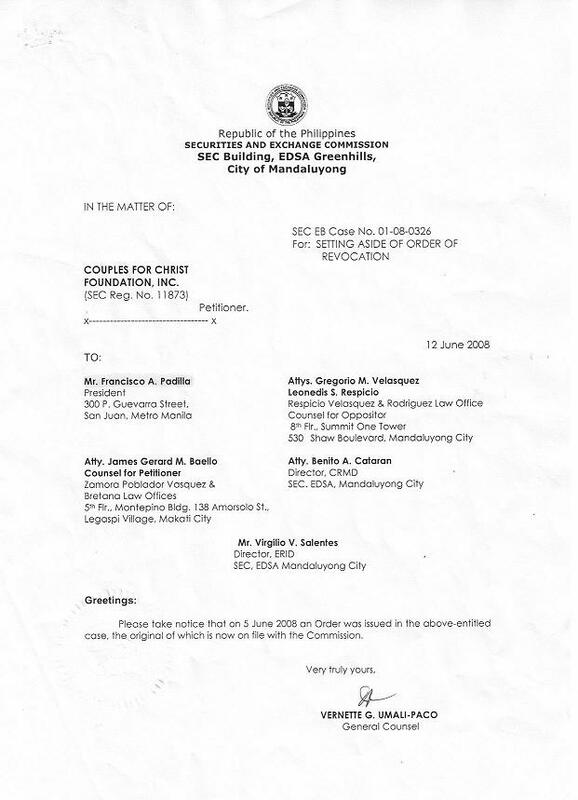 It is with some regret that we bring to the community's attention that CFC Global filed a case with the Court of Appeals against Couples for Christ Foundation Inc. (CFCFI) and the Securities and Exchange Commission (SEC). CFC Global has also petitioned the Court of Appeals to issue a temporary restraining order (TRO) or a preliminary injunction to stop both CFCFI and the SEC from implementing said order. However, the Court of Appeals has not issued such TRO or injunction. This means that the SEC order remains in full force and effect, and that there is no legal obstacle whatsoever to our use of the names/acronymns "CFCFI," "Couples for Christ", "CFC", or even "CFC-FFL". 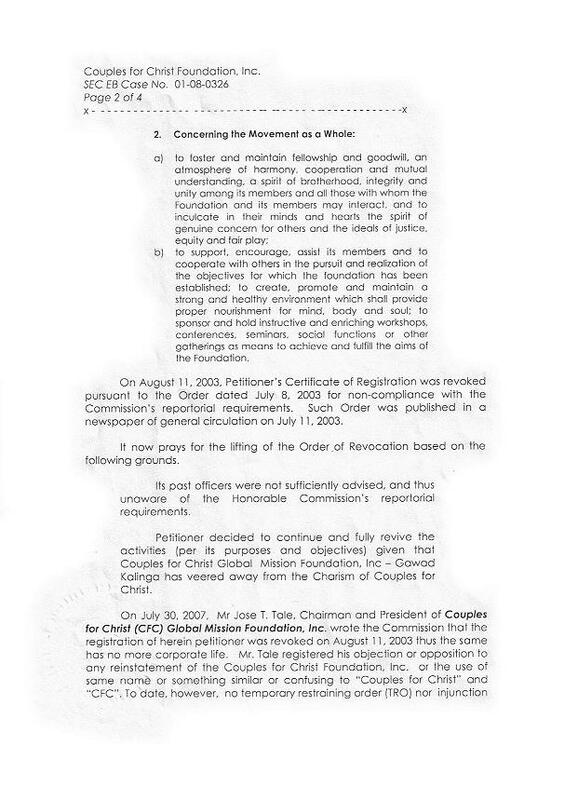 We have explained in a previous circular that the SEC order allowing the use of the CFC Foundation, Inc. name, as well as the latest Vatican letter of Cardinal Rylko allowing both communities to exist in any diocese in the world (provided the Bishop of the place authorizes it), would have settled the issue of the use of the name "CFC," both from a pontifical standpoint and the legal sense. In truth and in fact, CFCFI /CFC-FFL now has primacy over the use of the name because of its "prior right" and earlier use of the name "Couples for Christ." Our Servant General has gone on record that in view of both the Vatican and the SEC accreditations for and in favor of CFCFI/CFC-FFL, we had plans of just letting the issue pass and allow a peaceful co-existence of both communities to subsist. But now that CFC Global has placed us anew on the defensive, and chose the legal arena at the appelate level, we are left with no other option but to comply with the requirements of the law by defending the position of CFCFI. This we are constrained to do with much hesitation and regret because our brethren at CFC Global have chosen a different path. To all CFCFI members, we issue a call for restraint and sobriety and most of all, more prayers that both communities will choose the more Christian attitude of "beating their swords into plowshares" and peacefully co-exist with love and joy in our hearts. CFC-FFL / Couples for Christ Foundation, Inc.
Subject: COUPLES FOR CHRIST FOUNDATION, INC.
CFC-FFL now has another reason to rejoice and thank the Lord. 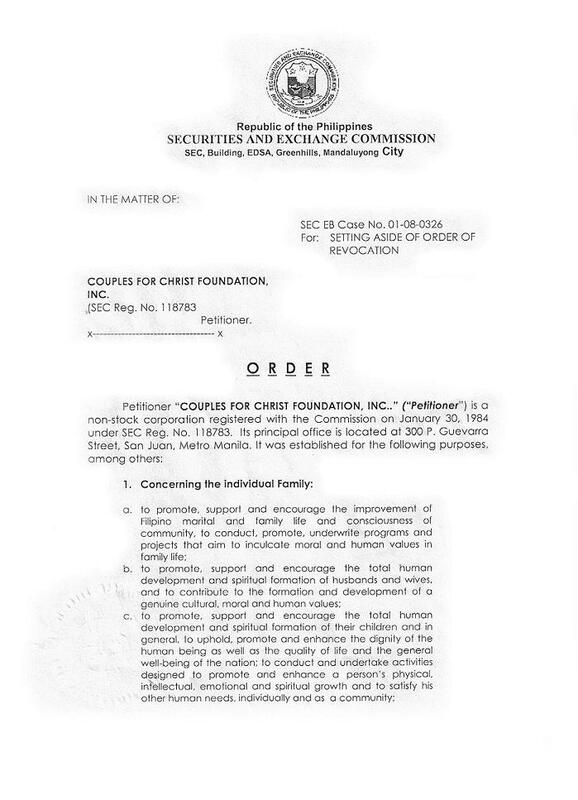 COUPLES FOR CHRIST FOUNDATION, INC. (CFCFI), originally established and registered with the Securities & Exchange Commission (SEC) in 1984, has been revived. 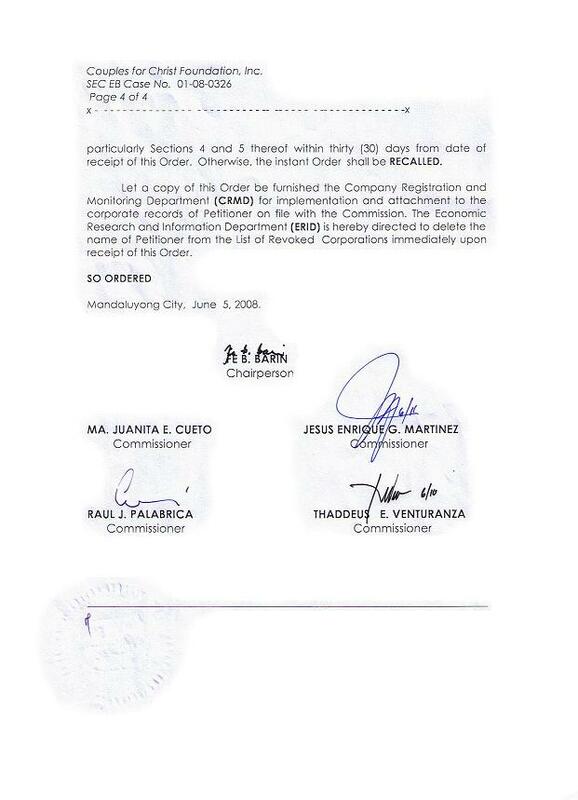 This is by Order of the SEC dated June 5 and issued on June 12, 2008. By this Order, the SEC has affirmed our right to call ourselves “Couples for Christ.” CFCFI iterates its vested right, by virtue of original incorporation, to the use, enjoyment and ownership of the CFC name. 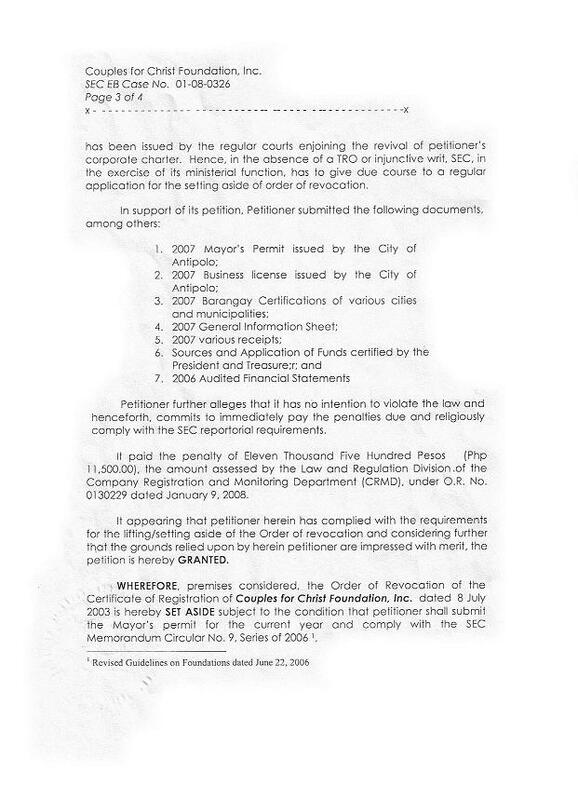 Other entities may only use the said name upon explicit permission of CFCFI. CFCFI is fully operational. The work continues, and with it, a request for prayers of thanksgiving for all who made this possible. Most of all, we honor in a very special way, our Mother, Mary Mediatrix of All Grace, through whose intercession our prayers for the revival of CFCFI was made possible. Let us be vigilant as the work in the vineyard of the Lord continues. THE WORK OF RESTORATION CONTINUES.